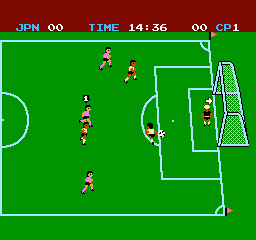 Soccer is a sports game that was first released on the Nintendo Famicom in 1985. There's two modes offering both solo matches (with five CPU skill levels and seven teams to choose from) and two player competitive matches. The controls are basic, with shooting mapped to the A button and passing to the B button, and your goalkeeper can also be moved using Up and Down on the d-pad. The gameplay is slow, with painstaking scrolling and players that move as if they're wading through mud. There's many shoddy coding issues, including defenders that ignore balls that land next to them, and goalkeepers that prefer to casually drift between the posts rather than paying attention to the incoming attacker! Players frequently run into an offside position too which is a real annoyance and disrupts any tactics you might try to employ. The game regularly chooses the wrong player for you to control, and attempting to manually override this usually results in a teammate being selected who's nowhere near the ball! Similar to Double Dribble (1987, NES) you're treated to a neat halftime show with cheerleaders, but weirdly, teams don't even change sides when the second half begins. You also get little for winning a match, as a short jingle plays before you're kicked back out to the title screen. If you do manage to get some enjoyment from the game its replayability is extremely low due to the lack of available options and the inability to play anything other than single matches (e.g. no tournaments). The two player mode is a bit more entertaining (especially when a match is tied and you face a penalty shoot-out), but even then it feels as if you're trying to make the best of a bad situation. Soccer has barebones options, very little depth, gameplay that's starting to show its age, and various technical issues that affect the action on the field. Although it's hardly a compliment, its only saving grace is that it's at least marginally better than the horrific World Soccer! (1987, Master System). Random trivia: The music was composed by Koji Kondo, who's most known for his work on the Super Mario and The Legend of Zelda franchises.